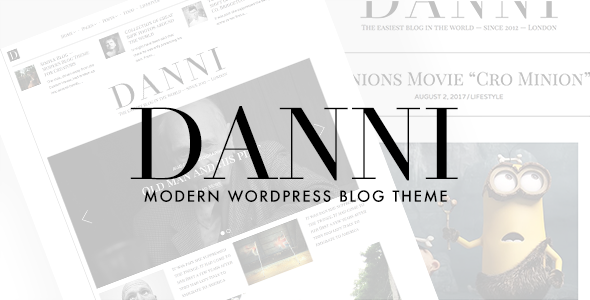 DanniÂ is a very-easy-to-work-with WordPress Themes for bloggers with modern look and strongly focusing onÂ typography, ease of use and minimalist in design philosophy. Itâ€™s suitable for fashion magazine, tech news, traveling writers, food stylists and so on. WordPress 4.9+ compatible and will be always compatible with latest versions of WordPress. Responsive: Danni looks well on all devices like iPhone, iPad. Sliders also work well with touch and swipe gesture. Translation ready: It not only contains default *po file so you can turn your site into any language, but also integrates a â€œQuick Translationâ€ module to help you translate visual words on the fly. Off-canvas mobile menu: Professional mobile menu integrated into Danni, it looks like Facebook open button on mobile. Just test it yourself on mobile to see it in action. Powerful Live Customization with options to on/off things. You can select your own font faces for heading and body text as well as your favourite colors. Use ANY FONT: Danni allows you to select 800+ Google fonts and change it for title, heading or main content text. Featured Post System: Danni integrates a featured posts system thatâ€™s very easy to use. To set a featured post, click to the star next to that post. Custom Logo upload: You have option to upload both logo & retina logo. Itâ€™s the same for footer logo & footer retina logo. It uses the latest beautiful uploader of WordPress. Conctact form 7Â integrated andÂ you can setup a contact form easily. SEO friendly:Â Radians designed by HTML5 & CSS3 Standards with carefully calculated tag & heading. Dedicated Support & Lifetime Upgrade:Â Once purchased the item, youâ€™ll get free update lifetime.